Good morning! I hope you’ve had a great week! Mine has been busy busy busy. We’re cleaning stuff out, paring down, donating a bunch of stuff, just trying to get the house more manageable in general. The cats are starting to give me the side eye, worried that they’re next. The dog doesn’t care what we do as long as she gets fed. I hate doing it — the cleaning out — but at the same time, I found a shoe I’ve been looking for for about the last six months, so w00t! Maybe I’ll finally find the wedding band I’ve been missing for three years. It’s Black Tie week at Dynamic Duos. 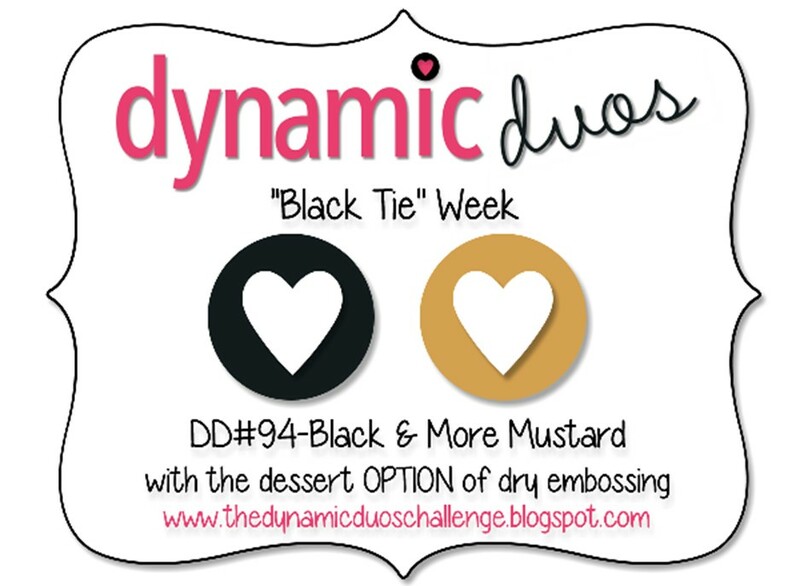 The colors are Basic Black & More Mustard, and the dessert OPTION is dry embossing. I don’t have much to work with in More Mustard, because they retired it right before I became a demo (or right after? ), so I used Crushed Curry instead of More Mustard. I glued down a strip of Silver Glimmer Paper and topped that with more DSP from Eastern Elegance. I wanted the spiky edge of the starbursts to carry over to the DSP, so I trimmed both edges, slanting both ways, with one of the Finishing Touches edgelits. Perfect coordination with the framelits! I needed my little exploding star paper thing to stand out from the background DSP, so I added a starburst in Basic Black. 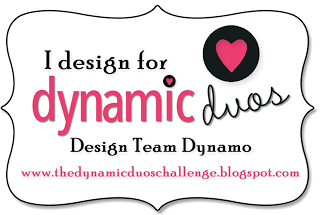 I embossed this with the Chevron embossing folder and my Big Shot. I wanted it to stand out in the photo, but in my experience, embossed black cardstock doesn’t show up in photos. Then my eye landed on the Illuminate glimmer ink, which has gotten very little attention from me. In fact, when I first got it, I was like, um, okay, I have no idea what to do with this. So I decided to give it a shot. I inked up my brayer (another of those things that I got and have used maybe once, because I don’t really know what to do with it) with the Illuminate ink, then lightly ran it over the embossed starburst, hoping I wouldn’t get any into the recessed parts. I was so happy when it came out perfectly! Oh, and then I thought of all the things I can do with the Illuminate ink now that I get it. In fact, I had stamped a different sentiment in a different ink, but after seeing the Illuminate shine on the black cardstock, I decided I needed that. I took about half an hour to decide on my sentiment, from Perfect Pennants. The little criss-cross thingy across the bottom of the banner is from the same stamp set. I took another half hour to find my Banner framelits, because I haven’t cleared off my desk in ages, and it was hiding under many piles. I cropped the sentiment, then shredded a piece of Crushed Curry Chevron Ribbon (just the ends), then stapled that behind the sentiment — again for contrast. 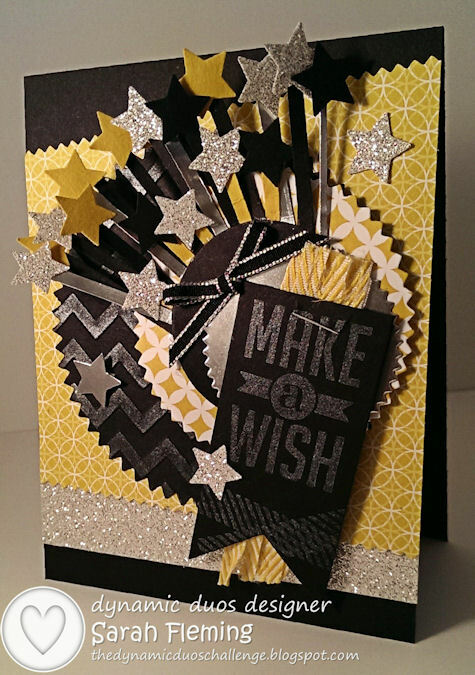 I punched out all the stars from Crushed Curry, Basic Black, Silver Foil, and Silver Glimmer Paper and attached them with Glue Dots to the sticks, then added a couple with Dimensionals and Glue Dots to other parts of the card. I hope you like the card! Have a great Saturday. I’m off to clean out the garage. But you should be off to see the other fabulous creations by the other designers! Wowsers, Sarah. Great card- anyone would just be overwhelmed to get this fun, creative masterpiece. I am in the putting away phase and wish I had done more purging at the beginning! Good Luck! This is fantastic!! Love the stars attached to your Fringe Scissor stems and all of your other festive details- so festive and fun! !